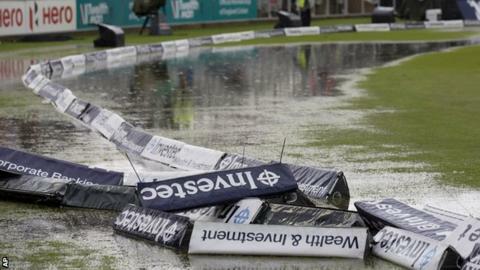 Lancashire director of cricket Mike Watkinson apologised to fans after the second day of England's fourth Test with India was curtailed by rain. Players were forced off at Old Trafford at 14:15 BST with England on 237-6. Despite heavy rain stopping 90 minutes later, ground staff could not drain a corner of the outfield. Play was abandoned to angry boos at 17:39 BST. "We apologise if people feel let down, but these are extreme circumstances," Watkinson told BBC Radio 5 live. "It was an extremely heavy downpour and most grounds would have struggled." It is not the first time Old Trafford has been at the centre of pitch issues. In 2009, a Twenty20 international between England and Australia had to be abandoned before a ball was bowled. A two-metre square sodden strip of grass on a bowler's run-up made any prospect of play impossible, even though conditions were fine otherwise. Old Trafford's drainage system was revamped in 2008, requiring Lancashire to play their home matches elsewhere. After the rain stopped on Friday afternoon, staff deployed motorised mops, brooms and sand to try to soak up the water near the boundary rope. Watkinson, a former England all-rounder, said the problematic area at the Brian Statham End had recently been re-turfed. "We have an area that has some new grass, some turf that is not quite as established as the rest of the field," he said. "The drainage is fine, but it was used for some construction work during the off-season. The pitch drains to this side, there is a natural fall. This is where the water congregates. "If we have got anything wrong, it's hitting it with the waterhog and disturbing the surface. Ideally, it would drain through naturally." Although there was provision for play to continue until 19:30 BST, it had to resume by 18:00 for the rule to be invoked. Former England batsman Geoffrey Boycott criticised organisers for putting player safety ahead of the paying public. "This sort of thing hurts cricket," he said on BBC Test Match Special. "The evening was set, we could easily have played on. "Did the groundstaff know about this? If so, they should have covered it or brought the boundary in. It wouldn't have been pleasant fielding on it, but we have to get on with the game. "There's a bigger picture. People pay a fortune to watch. That's bigger than a couple of cricketers slipping over." An unbroken partnership of 67 between Joe Root and Jos Buttler helped England build a healthy lead before rain curtailed the second day. The lack of further play on Friday could dent England's chances of sealing the victory they require to take a 2-1 lead in the series with one match to play. England currently lead India, who made 152 in the first innings, by 85. Saturday's forecast is good, but further rain is expected to fall on Sunday and Monday. Speaking on Test Match Special before Saturday's play, Watkinson added: "I do feel we are making a big issue about losing about 45 minutes of play." Asked about the prospect of further rain, he insisted: "We'll do everything we can. We'll take every measure possible. If nature beats us it won't be through lack of effort." "Everyone is frustrated," said England batsman Ian Bell. "With the Test match so nicely balanced we'd all love to be out there. "It's a shame for everyone, the players and the supporters, but the groundstaff have given everything to get us out there and it's just unfortunate we couldn't."